From time to time I'm asked to make a custom item for someone. Here are a few examples. If you have a special request, please send me an email. 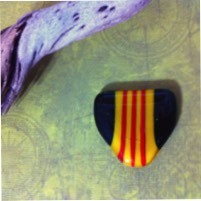 This pendant was made as a gift for a Vietnam veteran. The aventurine green on the ends of the pendant has a beautiful deep sparkle in the sun. A large silver bail was affixed to the pendant and the pendant was suspended from a Greek leather cord. Custom made to match customer's necklace. 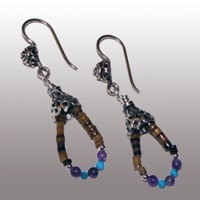 Includes heishi shell and tiny turquoise and purple beads hooped into sterling silver cone and hung on Bali-style silver ear wires. 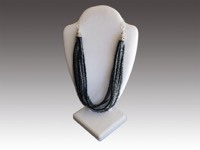 Custom-ordered multi-strand necklace in shades of black, with sterling silver cones. 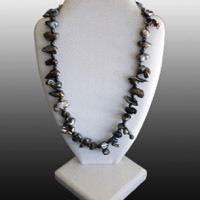 This was a custom order made of irregularly shaped freshwater pearls. Very nice. 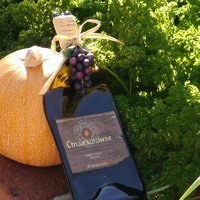 The customer requested a particular bottle and label and this is the result. 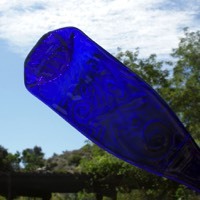 The label was provide a little torn so it was decoupaged and made part of the design. 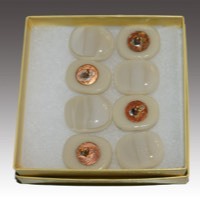 Custom-made fused glass buttons made to order. On one of my sister's Titanium 5th wheel rallies, she was given this really big wine bottle to bring to me to fuse flat. It just fit in the kiln and came out beautifully. We gave it back to the original owner who was amazed. I made this special for the 6-yr.-old daughter of a business associate. 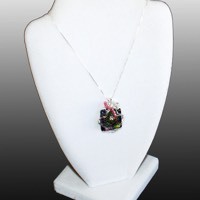 It's a dichroic pendant wrapped in silver wire with Swarovski crystal beads. 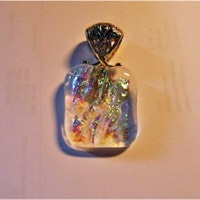 I made a pendant similar to this one for my friend, Angelika in Switzerland. She wore it one day and her friend admired it so much that Angelika asked me to make another one as a gift. Although it is photographed on a pink background, it is actually clear with gold striations.